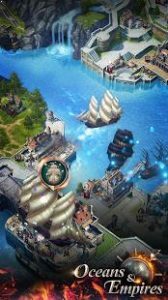 Oceans and Empires : Embark on a journey to discover new cities, trade, form alliances, and battle against other Lords to dominate the ocean! Great game Graphics are nice, lots of stuff to keep you busy. But for me personally the game is frozen. I can’t do anything. Build, research, make units, weapons.. I’ve turned my phone off. Not sure what the problem is..
Hi Liam! We do apologize for the inconvenience this has brought to your gaming experience. Please send an email to oceansandempires@joycity.com and inform us the details of the account so we could assist and help fix the issue. Thank you. Love it this game is brilliant love it so far, off the bat you get two free’ builders so cool , you can get stuff done ! not like other game I played were you get one and you have to buy more straight away if you want to have a1hr build going on the main base build and upgrade the the smaller stuff. New ship for more strategies! Conquer the seven seas, fight Lords from all servers! Complete Seasonal Quests and get items! New Lord Skills for the late game! And various other fixes for better gameplay.